Riot has returned to deliver pure American heavy metal to the masses! 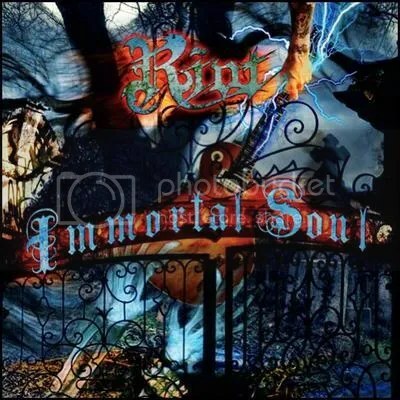 Immortal Soul features the reunited Thundersteel/The Privilege of Power line-up (with additional guitarist Mike Flyntz) that featured the gifted Tony Moore vocals. I’ve always said Riot has never released a bad album. They’re taken a few twists & turns when it comes to the style of rock/metal they would play, but it’s always been quality stuff. I really didn’t have any doubts about the quality of Immortal Soul and became even more enthusiastic for it when the excellent “Wings Are for Angels” was released for streaming earlier this year. That’s one of my favorite songs of 2011! This album is a great trip back in time. The production is fantastic but the songs are written like this is the direct follow-up to Thundersteel. Anyone who was a fan of that album and Privilege of Power will NOT be disappointed with Immortal Soul. Yeah, this is American POWER metal at its finest. Mark Reale is still firing off some nice solos and coming up with great riffs, Bobby Jarzombek is a monster on the drums as always and Tony Moore is still killin’ it on vocals. 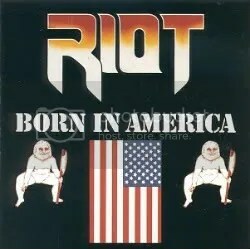 Riot is one of the great American heavy metal bands. It’s a shame they never got the widespread recognition they deserved in the 36 years of their existence. Mark Reale is one of metal’s best guitarists even now. Though the world at large may be unaware, for those of us in the know, we know that Riot’s place in the pantheon of heavy metal is secure. This is an album not to be missed by Riot fans or anyone into a more tradition heavy metal sound from bands such as Judas Priest. This whole album is classic Riot full of the thrashers, speed, power and melodic metal that many fans fondly remember from the previous Tony Moore era. Those Riot boys are back at it again delivering even more great heavy metal to the masses (or Japan and Europe, at least)! It still boggles the mind that these guys aren’t heavy metal legends after delivering great album after great album since 1977! This album didn’t get a U.S. release until 1999 under the Metal Blade label (which featured the bonus track “Faded Hero”), but was originally released in Japan in ’93 (featuring the bonus track “Black Mountain Woman”), then Europe in ’94 (which features “I’m On The Run” as a replacement for the Procul Harum cover “A White Shade of Pale”, which is available on the Japan and U.S. pressings). My particular copy is a Russian reissue from 2002. I almost thought I would never have this album. It seemed to be out-of-print and everywhere I looked online it was crazy expensive then I came across NuclearHell.com and was ecstatic find buy a brand new copy at a good price. All three versions have a different cover, none of which make much sense in relation to the album’s title. The European covering featuring the shark is easily the best though and is pretty cool but it looks like something Great White would use. It’s a shame this album didn’t get a U.S. release sooner, but given the sound of the album, it wouldn’t have made much of a difference considering the musical climate at the time. With Nightbreaker, we once again hear a new vocalist — Mike DiMeo. He has an excellent set of pipes and is a great replacement for the departing Tony Moore. They both have similar styles. 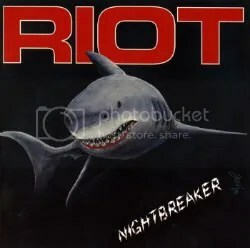 Riot is so good, I haven’t heard a bad album from them yet, but Nightbreaker is truly one of their elite releases. It continues the path of melodic heavy metal that Mark Reale started taking the band in with the last effort, The Privilege of Power. Riot always does great ballads and “In Your Eyes” is no exception, then you’ve got heavy metal numbers like “Nightbreaker” and “Destiny” where Mark Reale gets to show off as the guitar virtuoso that he is. There’s even a pretty good cover of Deep Purple’s “Burn” and Riot covers themselves with “Outlaw”, which was originally released on Fire Down Under way back in 1981. I happen to prefer this updated version. If you’re a Riot fan, this is a must have! After frequent changes in style (NWOBHM, southern fried hard rock, heavy metal, power metal) over the span of four albums, Riot founder and guitarist Mark Reale finally settles in and keeps The Privilege of Power in the same realm as Thundersteel though it is a bit more melodic at times. Vocalist Tony Moore (my favorite singer Riot has had) really delivers all throughout the album. The album is not without a few odd choices though. Virtually every song has the annoying habit of some audio clips and sound effects from news and movies and whatnot. It really disrupts the flow of the album when all I wanna do is hear the music. I suppose there was some statement behind all of this about society, government and the power of television and maybe if they did it for one or two songs, that’d be okay, but this is overkill. It is a full FORTY-SIX SECONDS before the music starts playing on the first track and for a few more seconds after that, the sound is purposefully muffled. That’s inexcusable for a heavy metal album! If someone was so insistent on these weird intros, they should’ve just made them outros (or better yet, their own tracks) so that as soon as you hit play or skip tracks you get to hear MUSIC. Another oddity is the use of horns throughout the album. Sometimes it works and sometimes it sounds out of place. But hey — if Aerosmith could do it, why not Riot ? Getting on with what is good about this album is we still get plenty of speed and power metal moments that stand up to anything done on the excellent Thundersteel album. “Metal Soldiers” is a great anthem and “Black Leather and Glittering Steel” is a fantastic speed metal number where Tony gets to do what he does best. “Dance of Death” is a strong power metal number. There are also a number of melodic moments (foreshadowing yet another change in direction for the band). “Maryanne” sounds like something out of the pop-metal scene crossed with Boston (the band, not the city) and the guitar work on “Little Miss Death” reminds me of Michael Schenker Group. “Killer” (accompanied by horns) features Joe Lynn Turner on vocals. Horns and interludes aside, this is another great Riot release featuring a nice blend of heavy metal and melodic hard rock. 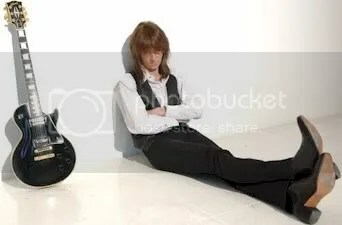 Too bad it would be Moore’s last album with the band and he would not return to sing for the group until 2008 (then left again in 2009). 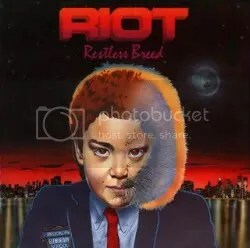 There’s nothing at all wrong with Riot’s previous album, Restless Breed (in fact, it’s a very good release), but Born in America is more my speed. It’s another shift in sound as Riot gets back to playing METAL instead of Southern-fried hard rock and I’m all for it. Rhett Forrester is still around on vocals (though this would be his last album with the band), but this time he actually wails and screams like all heavy metal warrior should! Didn’t know you had it in you, Rhett! By this point, the major labels were done with Riot and they found themselves on Quality Records, so yet again, we’ve got another great Riot album that went unnoticed (not that the majors ever helped the band in the first place). Riot sunk into inactivity after this release and it would be five years until Mark Reale (who is an underrated guitar player and song writer, IMO) staged a comeback with a brand new Riot line-up for the excellent Thundersteel. Despite the gap in time, in many ways Born in America is very close to the power metal the band would play on Thundersteel. We get the usual awful Riot album art. There’s an alternate version featuring a close up of a girl’s torso while wearing a white t-shirt that says “RIOT” on it. That’s the version I thought I was getting when I ordered this album online because it was the picture shown. That cover is pretty bad also, looking like some indie hair band album cover. On a sad note, in 1994 Rhett Forrester was a victim of a carjacking in Atlanta, Georgia and was fatally shot. I can think of no better way for his spirit to live on than through some of the great music he helped create. With original Riot vocalist Guy Speranza departing due to moral and/or drug addiction issues, the band shifts from the New Wave of British Heavy Metal sound of Fire Down Under to an all-American metal mix of blues, boogie and southern rock. No doubt, a change that was inspired by (or mandated) by the band’s new singer, Georgia-born Rhett Forrester (who I actually prefer as a vocalist over Speranza). It’s an interesting leap in sub-genres and the band is obviously going for a more commercial sound relying more on hard rock than heavy metal. When I first bought this, after having heard Fire Down Under and Thundersteel, I wasn’t impressed. It just wasn’t as heavy or as fast as I wanted it to be. It’s a different sounding album for sure, but still an enjoyable one upon closer inspection. I’ve given this album tons of spins since buying and it’s grown on me to the point where I this this is yet another underrated album from an underrated band. I just can’t understand why the labels couldn’t break this band. My favorite tracks are “Restless Breed” (which sounds like Riot doing their best version of Bad Company) and “Showdown”. 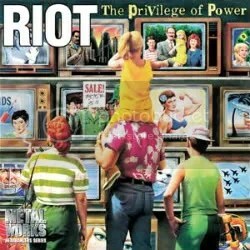 Another awful Riot cover, by the way. For awhile, I didn’t “get it”, but I guess it’s supposed to be showing the evolution of their mascot from the cover of Fire Down Under. Of course, it’s also symbolism for the band itself evolving.